This project answers to a need I had: a third hand that holds a camera while I perform a test and takes photos/videos (useful when you’re stuck at the lab late at night, and suddenly need a photographer). 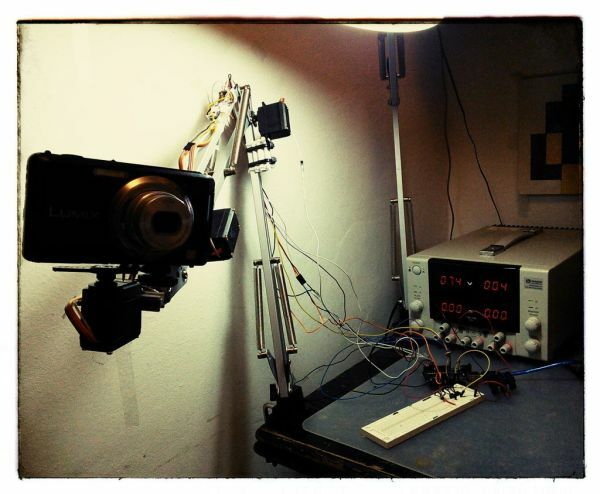 Motion capturing and playing device – you “teach” the arm what it should do, and it repeats the movement! (no programming or computer needed). 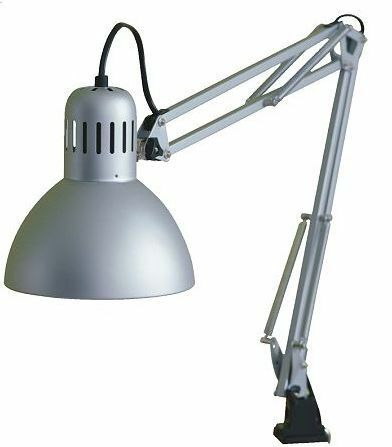 For long time I wanted to transform standard IKEA Tertial lamp (here) into a functional robotic hand, I wanted to make it easy, without any manufactured parts, and to control as many degrees of freedom (DOF) as possible. After modeling the lamp using my favorite CAD software, I realized the standard servos, placed in the right places can (to some extent) work. First step is, of course, to get a Tertial lamp, should be quite easy to get here, and remove the power cord (must be cut), dismantle the lampshade (But leave it’s connector !) and remove the springs for future use. Remove 4 cross bolts from the bottom. Assemble all back to have an “Analog feedback” servo. repeat 3 times for all servos needed for the project. Get a nut to mount the camera (any 3/8″ nut will do). Bend the little metal plate to straight line. Take any small block/profile and mount to the metal plate. Dismantle the triangular plate from the arm tip. Drill few holes to enable mounting of the servo arm to the plate. Tighten the servo body to the bar (I used spacers and zip ties – improvise! Dismantle the trapeze plate from the arm.